I didn’t potty train my girls. 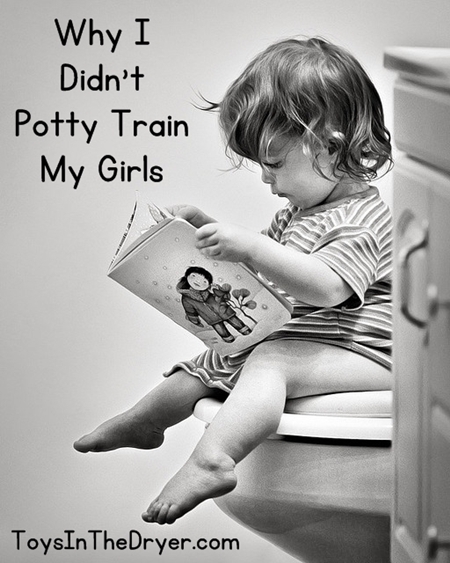 Yup, you read that right, I didn’t potty train my girls. I don’t believe in potty training. In my online mom and blogger groups people ask potty training advice all the time. I rarely pipe in with advice but when I do it’s, “let your kids do it themselves.” Your child’s ability to go to the bathroom on the toilet is both a physical/developmental process and a mental process. Despite you and your child’s greatest efforts, if your child’s body is not developmentally ready to potty train, it’s not going to work. This method does nothing but potty train you. Your child needs to learn his/her body cues for when to go to the bathroom. The timer method puts your child on a schedule and does nothing to promote your child’s natural cues and rhythm for when to go to the bathroom. It’s ok to ask your child if he/she needs to go potty through the day (as most kids get distracted and forget to listen to their body) but do not discourage your child’s body listening by putting them on a timer. You don’t go to the bathroom based on a timer, why should your child? While this is a good idea in theory (because rewards are better than punishment), this method only encourages children to sit on the potty for a reward and not because they feel the need to go to the bathroom. Many of my friends have tried the reward method only to quickly learn that their children frequently “go potty” so that they may have their sticker and or candy. Again, the reward method does not help children learn their body cues. I’m going to start by saying YOU CAN NOT NIGHT TIME TRAIN YOUR CHILD. Did you get that? Did I say it loud and clear enough? You cannot night time train your child. Your child’s ability to stay dry through the night is solely based on physical development and their subconscious ability to hold their bladder while sleeping. That is something you cannot teach. Waking your child at night to have them go to the bathroom doesn’t help. In fact, it may hinder night time training because it disrupts sleep. If your child wets the bed, so be it. Eventually, subconsciously, your child’s brain will figure it out and will wake your child on its own to go to the bathroom (or will hold it till morning). For now, stick with the potty training pants and mattress pads, limit liquids before bed, and realize that you’ll be washing a lot of sheets. This phase will not last long. You’ve heard of the method where you take a day or three and let your child run around pantless until they learn to hold their pee. I guess it has worked for a few friends. The problem is, unless your child is ready, you’re only going to end up with pee all over your house. You don’t have to do a three day bootcamp to train your child, when they are ready, they’ll hold their pee with or without pants on. I don’t go pee in the living room or kitchen so why am I going to teach my kids to do it? We go potty in the bathroom so THAT is where the potty chair goes. Kids need to learn to recognize their cues to go potty and then to hold their pee until they make it to the bathroom. Having the potty chair in the living room or kitchen only encourages your child to wait until it’s too late to go pee. So what did I do with my girls? I did do a few things…. My oldest was fully trained around 2 years old. My youngest was closer to 2.5 years as she had some underlying bowel issues we had to deal with. Both were stress-free for me, my husband, and my girls! Did you potty train your kids? What method did you use? Would you do it differently next time (if there were a next time)? I love this post and I think you are spot on……for girls. Having 3 boys I can tell you that the method of “not potty training” would never have worked. My oldest wasn’t trained until we started a sticker method (1 sticker for each time he went) and he was trained at 3.5 years. My middle was very difficult to train, he was closer to 4.5 years. We tried EVERY technique in the world and later we found out why it took him so long….encopresis. My youngest was 3.25 years when he was fully trained….he wanted to be like his big brothers. Oh thank you for this! My last child is sticking to his diapering guns at 3.5. My daughter didn’t potty train until she was 4–even though I tried every stinkin method you listed above. I cried, she cried..it was awful. Finally, she just did it on her own. I’m finding myself getting REALLLLLLLLY ready for my sweet little boy to decide he’s ready, I even told him “This is the last box of diapers I’m buying!” (He didn’t snort and mock me out loud–what a good boy!) Thanks for the reminder to be patient and let him do it. Grrrrrr….